Custom Dashboards let you group related charts together in to themed reports and share them with your colleagues. Custom Dashboards display a collection of charts and are an excellent way to group related charts together in to themed dashboards. They can be marked as private or shared with your colleagues. They can be viewed within the deltaDNA platform or automated for delivery by email, to selected users, at a frequency of your choosing. Custom dashboards can be tagged and organised into groups that can then be exposed on the navigation menu. 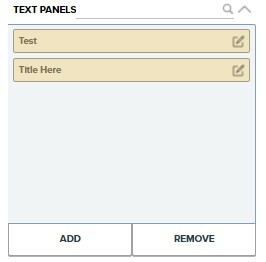 Text panels that are frequently used to contain a description of the dashboard contents. All your custom dashboards can be accessed from the CUSTOM DASHBOARDS region of the navigation menu. They can be organised in to groups to keep the navigation list from getting too long. Custom dashboards are cached to ensure optimal performance, despite potentially containing a large number of individual displays. There is a note at the top of the page that indicates when the cache was last refreshed and a “Refresh” button to refresh the cache. The “Use Filter” toggle switch is used to show or hide the standard dimensions filter bar at the top of each dashboard. You will need to click the “Refresh” button after applying a dashboard filter in order to reload the charts with the new filter applied. Please Note: the standard dimension filters may not be applicable to some chart types. The “Set Favourite” toggle controls whether the individual dashboard is included in your personal favourites list in the navigation menu. This can also be set on the “All” dashboard management page. The “Edit Dashboard” button takes you to the custom dashboard editor, where you can modify your dashboard. The Custom Dashboard Editor can be accessed from the DASHBOARD -> Custom Dashboards -> Editor link on the navigation menu, or by clicking the “Edit Dashboard” button on an existing dashboard. The editor is divided into four regions. Toggle between View and Edit modes. Note, a dashboard needs to be saved before you can view it. Name your dashboard. This can be changed later. Create a New empty dashboard. Copy the existing dashboard to a new one. Set the dashboard to Favourite to make it show up in the favourites section in the navigation menu. Specify which Users can access the dashboard when it is shared. Set whether the Filter bar is visible or hidden on the dashboard, by default. The Chart Selector region contains 6 panels holding all your saved chart queries. The panels can be minimised or maximised to reduce screen clutter and you can filter their contents by typing in to the header. The panels contain lists of saved Data Mining Queries, Slice and Dice Queries, Funnels, Measure Charts , Text Panels and Legacy Measure Charts. Use these panels to find the charts you want to put on your custom dashboard, then drag and drop them in to position. NB – The Insight team at deltaDNA can curate and publish new dashboards to all accounts, they will appear in the Recommended section of your navigation menu. We will be gradually improving and replacing many of the older Measure charts, but the Legacy Measure section will still contain the older charts for your convenience. Lets you change the position and size of up to 48 custom tables or charts per dashboard page. Drag & Drop a saved queries from the Chart Selector panels in to one of the 48 cells in the display editor to Add to the dashboard. Use the arrows inside the chart cell to change the Size or Shape of a chart, e.g. the number of display cells that it spans. Remove a chart or table from the custom display by clicking the delete icon or dragging the table/chart out of the display area. You can specify whether a query from Slice & Dice or Data Mining is displayed as a Table or a Chart by selecting the radio button next to the appropriate icon in the custom dashboard display panel. Don’t forget to save your custom dashboard after making any changes to it. Click on the Save button on the Toolbar at the top of the Custom Dashboard Editor. Creating Custom Charts and Queries. Once you have created a query and defined the visualisation options you can Save the query in order to make it appear in the relevant custom dashboard chart selection panel. The Apply Dashboard Filter can be used to preview what your chart will look like when various filter options are applied to it. Measure charts are saved in a slightly different way. They are simply existing charts with a defined set of filters applied to them. The Custom Charts builder can be accessed from the Measure -> Tools -> Custom Charts link at the bottom of the navigation menu. You can use the Chart Select list to choose which chart you want to work with, then setup your filters as you would with any other Measure chart and finally give it a Name and Save it. Text Panels are often used to provide a longer description of the custom dashboard or an individual chart on to the custom dashboard. They can be created and edited directly from the custom dashboard chart selection panel. Selecting the DASHBOARD -> Custom Dashboards -> All navigation menu link will take you to the custom dashboard management tool. From here you can manage and organize your dashboards and even alter the Custom Dashboards navigation menu structure. This tool has quite a few UI elements, so we’ll split it in to 4 areas and look at each separately. The Custom Dashboard Navigation Menu lets you access individual custom dashboards or the dashboard management tools. Dashboards are grouped together, some groups such as All, Favourites and Recommended are common to all games, but you can use the Tagging system described below to create your own dashboard navigation categories that will appear on the menu. The Custom Dashboard List shows all your custom dashboards in alphabetical order. You can search or filter long dashboard lists by typing in the search panel at the top. Each dashboard contains legends to showing their visibility and privacy settings, as well as any tags associated with them. You can multi-select dashboards and apply Tags to all of them simultaneously by selecting them with the checkbox to the right and clicking the Tag Multiple button. View the custom dashboard. If you want to view the charts on a custom dashboard. N.B. This may be the only way to get to a dashboard if it hasn’t been added to the custom dashboard navigation menu. Tag an individual dashboard. Clicking the tag button will open the tag manager for this dashboard. From here you can add or remove tags to this dashboard. Each dashboard can have multiple tags associated with it. The same tag can be associated with multiple dashboards. Tags are used to group dashboards together in to themed categories. These are the same tags that can be assigned to events and parameters elsewhere on the platform, to group them together. The Load button will open the individual dashboard in Edit mode so you can modify it. The Tag Manager shows you which tags are associated to custom dashboards and lets you manage the tags. The Manage Tags button will open the tag management tool. From here you can add, edit or remove tags from the overall list of tags. You can also Pin a tag which will cause it be displayed in the custom dashboard navigation menu like the GAMEPLAY tag in the image above. Below the manage tags button is a vertical list of all the Tags that are currently associated to your dashboard. At first, you will only have a “WITHOUT A TAG” section, but as you add tags to your dashboards the list of tags will grow. The number to the right of the tag name indicates how many dashboards have this tag assigned. The Pin icon to the right indicates if the tag is displayed in the custom dashboard navigation menu. Cool Tip : If you click on any of the TAG bars it will filter the Custom Dashboard List to show only the selected Tags. When you do this and additional Clear Filter button will appear to let you clear any filters.